The Future of Logistics—20 Trends to Follow in 2017 | Planet Paper Box Group Inc.
Supply chain is now a key competitive advantage for businesses. Companies like Amazon and Inditex, who set new industry standards for innovative logistics in 2016, are a testament to the role supply chain plays in a company’s success. As we ring in 2017, one thing is for sure: CEOs and CFOs will be putting more emphasis on supply chain. Amazon has forced a barbell effect in retail—you can exist as a high-end boutique on one end, or a hyper-local, high-convenience retailer on the other end. If you live in the middle, you’re a commodity player who will get eaten alive. In 2017 look for two things to happen: first, Amazon will continue its push from the middle-out as it gets stronger in high-end and fashion merchandise, and it starts to encroach more on day-to-day needs. And second, forward-thinking “in the middle” players will show evidence of long-term viability as they begin to see positive results from in-store pickup, ship-from-store initiatives, and pop-up distribution solutions. The “innovate or die” cliché will prove to be a sad reality for some, as at least one well known retailer will file for Chapter 11. What has always worked in the past will not continue to work in the future and embracing unconventional thinking will become a hallmark trait for successful companies in 2017. 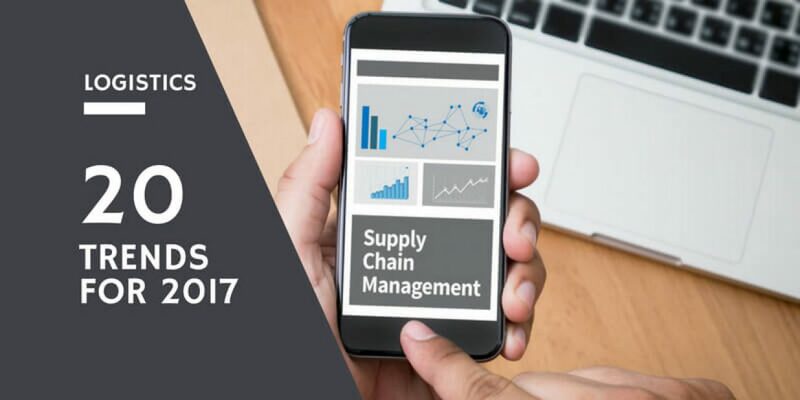 Businesses will be forced to evaluate their supply chains and address outmoded and inefficient processes. Examples include everything from enterprise resource planning (ERP) solutions and factory communications to freight forwarders and forecasting and inventory management software. Businesses which break down silos by focusing on transforming efficiency, transparency and risk exposure will gain an advantage. Overall net savings can be measured through reduced routing delays and faster reactions to changing trends. Trump has talked a LOT about wanting to rewrite NAFTA and about redefining our policies with China. These things take time – and may never happen, but it will be interesting to see what impact the rhetoric alone will have on companies’ strategic thinking. Will more investments be made in U.S. manufacturing? Will the government pressure more companies to suspend plans to export jobs? This is one to watch as it unfolds throughout 2017. Otto, a self-driving solutions provider owned by Uber, just ran a promo with Budweiser highlighting their first delivery aided by a driverless truck. Otto’s services won’t take over in 2017, but its progress will usher in the emergence of this technology on a broader scale. Companies will start to test more broadly, lured by the promise of faster, cheaper and safer deliveries. Here’s a list of five companies currently working on driverless trucking technology. Amazon, the world’s largest shipper of goods, and Walmart, one of the nation’s largest fleet owners, have their eyes on this technology as well. Last mile delivery will continue to expand and then consolidate. With the acceleration of technologies like driverless vehicles and drones, we can expect to see more entrants into the last mile delivery industry. Only to be followed by a round of consolidation, resulting in a few cash-rich big brothers and sisters like Alphabet and Amazon. Expect more focus on made in the USA, locally sourced/produced/designed goods and products made/marketed for specific cities and regions. Customers want to know where their products came from in addition to getting them delivered same day. Hyper-local and getting products closer to customers will be the key to faster, cheaper delivery times. Retailers are going to continue to push on their vendors to produce goods sold exclusively through their channel to compete and differentiate themselves from Amazon. This behavior will be rewarded with increased reward programs (free shipping, higher discounts, etc.) for customers who show loyalty to these retailers. This will require more specialization by manufacturers, without increasing costs. Companies with more traditional supply chains will begin adopting new technologies to augment their supply chains. On-demand technologies like Convoy, FLEXE and Flexport will see a spike in adoption across historically conservative companies due to the urgency to innovate and add flexibility to the supply chain. Even giants like Amazon will consider investing in on-demand logistics technology to gain advantage. This is a buzzword from 2016 and 2015, but we have still barely scratched the surface on retailers truly implementing omni-channel supply chain capabilities. ARC Advisory Group did a recent market study on omnichannel fulfillment technologies that also forecasts continued growth in this area for 2017. The use of robots in loading, unloading, and even delivery will increase in 2017. Amazon is already using robots to carry shelves of products to human workers and plans to automate its worldwide warehouses in the following years. Automation will help logistic companies to ship items to customers faster, cheaper, and with great accuracy, but it will also begin to reduce the need for warehouse workers. ARC did a recent survey on investment priorities in the warehouse and about 15 percent of warehouse executives said procuring autonomous mobile robots in the next three years was a priority for them. Another buzzword we’ve been hearing for a while. This technology was mainly used to enable machine-to-machine communication and improve shipping efficiency, but, IoT is expected to play a bigger role in the future of logistics in 2017 and increase speed, reduce waste and decrease overall costs. Many believe that IoT will enable communication with other new technologies, such as AIDC (Automatic Identification and Data Capture,) RFID (Radio Frequency Identification,) or Bluetooth to identify elements that need to change according to demands of companies and customers.